Coconut oil can help reduce hair damage (protein loss) by up to 39 percent, helping to stop your hair from falling out (1). In this article I’m going to show you other ways coconut oil may help to prevent hair fall such as by reducing inflammation and protecting against infection. This will include a look at the studies that prove the benefits of coconut oil. 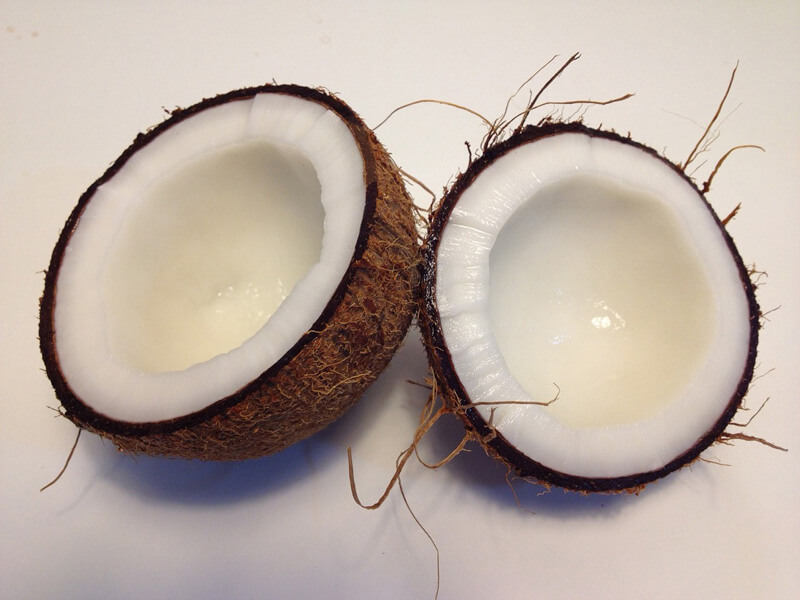 Originating in the Indo-Pacific region, the coconut is a palm fruit with a variety of uses (2). The oil which is so commonly used throughout the world is obtained from the “meat” of the coconut, either through dry or wet processing. Used in the kitchen for its mildly sweet flavor and in the treatment of a wide variety of medical ailments thanks to its high fatty acid and nutrient content, coconut oil has certainly earned its place among the list of most versatile oils. It’s even one of the active ingredients in Wild Growth Hair Oil which you can read more about here. But can you use coconut oil for hair growth? Let’s take a look! When it comes to strengthening hair and restoring damage, one of the most important qualities of a hair product is how well it can penetrate the hair shaft. An illuminating study was published in 2012 which utilized radioactively-labeled coconut oil to best measure how penetrative coconut oil truly is on the hair shaft (3). 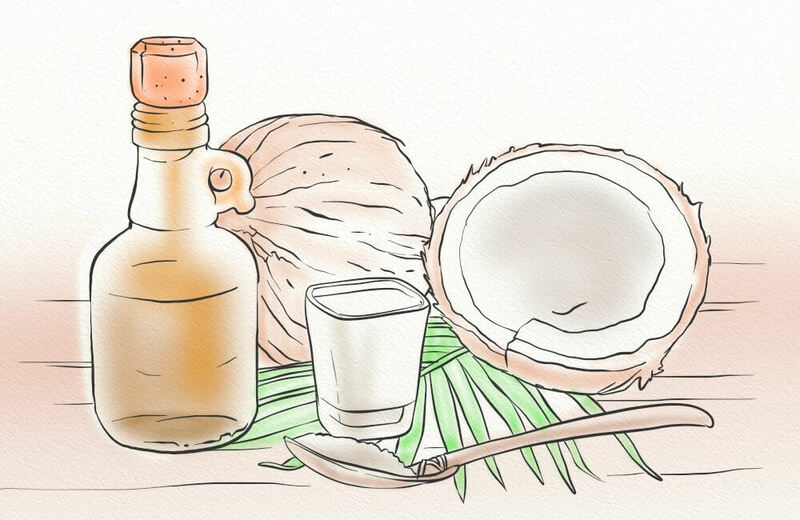 A single 10-cm-long strand of hair was soaked in 1.5 ml of coconut oil. Prior to this step, the coconut oil was heated in the presence of tritium gas (a radioactive isotope of hydrogen). Samples of the hair were taken at the one- and six-hour marks, and each of these measurements were performed on three separate samples from the one strand of hair. Within the highlighted area of the above chart, you’ll see the penetrative results of the one-hour measurement (1A, 1B, and 1C) and the six-hour measurement (6A, 6B, and 6C). On the low end, the results show that after one hour, one single strand of hair can absorb almost 15% of its weight in coconut oil. After six hours, the results of three separate measurements show an increase to 20.4%, 21.91%, and 26.3% of oil absorbed. For those individuals suffering from hair thinning and loss, these preliminary results are certainly promising. The obvious penetrative abilities of coconut oil make it a great supplement for those looking to strengthen their hair and prevent further loss, and these penetrative capabilities also lend themselves to another purpose: damage prevention. With coconut oil’s high levels of penetration, it should come as no surprise that the oil is also highly effective at preventing damage from occurring to the hair. 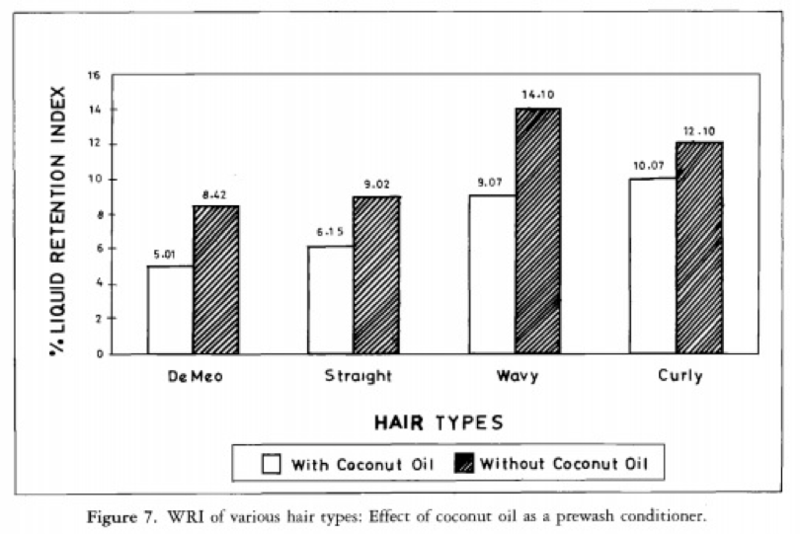 One particular study, performed by Rele and Mohile, highlights coconut oil’s ability to prevent protein loss in hair by reducing the amount of water absorbed during saturation (4). This study utilized four hair types, three of which were of Indian origin (straight, wavy, and curly), and one of which was untreated and provided by a producer of human hair wigs (DeMeo). Each hair type underwent eight separate treatments prior to testing, and all eight treatment types were performed with the help of twenty-five tresses of each hair type. The treatments included (a) undamaged control; (b) undamaged/coconut oil; (c) bleached; (d) coconut oil/bleached; (e) bleached/coconut oil; (f) boiling water; (g) coconut oil/boiling water; and (h) boiling water/coconut oil. After treatment, the tresses were washed with a 20 percent solution of Sodium Laureth Sulfate (SLES) and evaluated for a number of qualities, including protein loss caused by wet combing. The researchers postulate that coconut oil’s hydrophobic nature lends itself to the majority of its protective abilities. All fats and oils, due to their chemical composition, are hydrophobic substances. This means instead of dissolving in water, fats and oils “repel” water molecules (actually, it’s more of a lack of attraction). 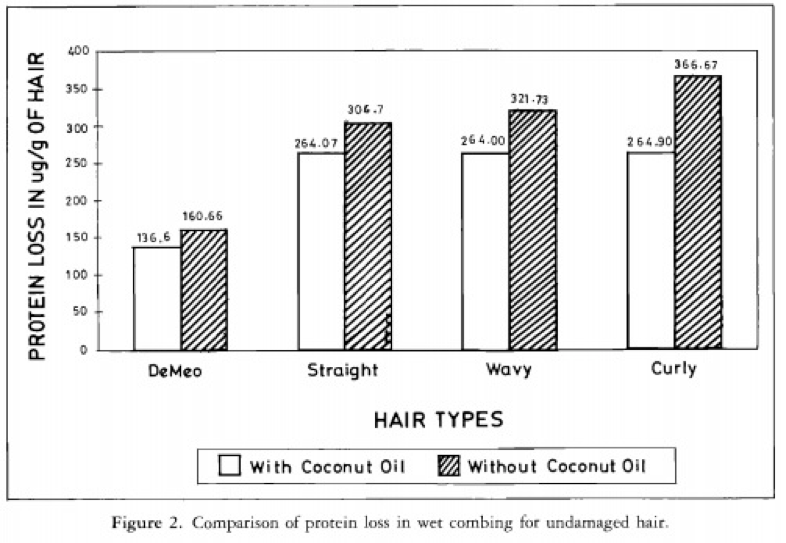 In the above study, the coconut oil which is coating the hair as a prewash is not interacting with the water molecules applied during the wash/rinse cycle. 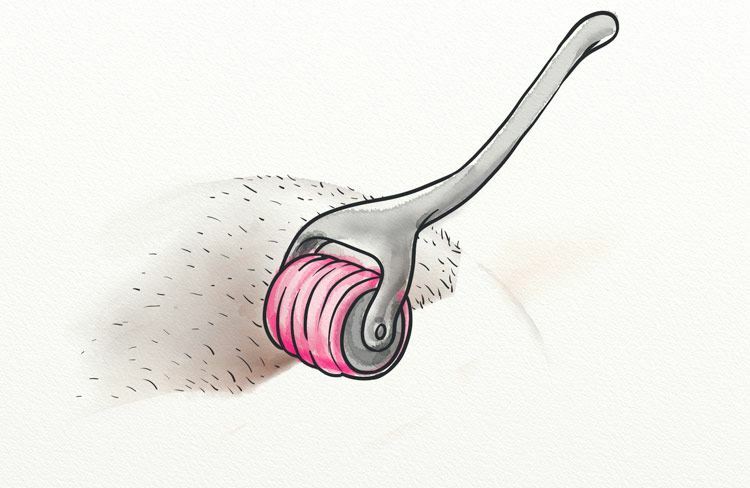 This lowers the water retention levels of the hair shaft, and it makes it less likely for the surface cuticle of the hair to lift away (due to swelling of the hair shaft) and break off during combing. Scalp inflammation can certainly be irritating, but did you know that chronic scalp inflammation can also lead to further hair thinning and loss (5)? Inflammation is the body’s way of protecting itself. This occurs during allergic reactions, when the body’s immune system attacks the perceived threat, and it also occurs immediately following an external injury. And, while short-term inflammation serves its purpose, chronic inflammation can damage the hair follicles and lead to excessive hair thinning and loss. If you suffer from chronic hair loss, you may be asking yourself whether inflammation played a role. While there are forms of alopecia unrelated to inflammation, inflammation can contribute to hair loss for a large number of hair loss sufferers. 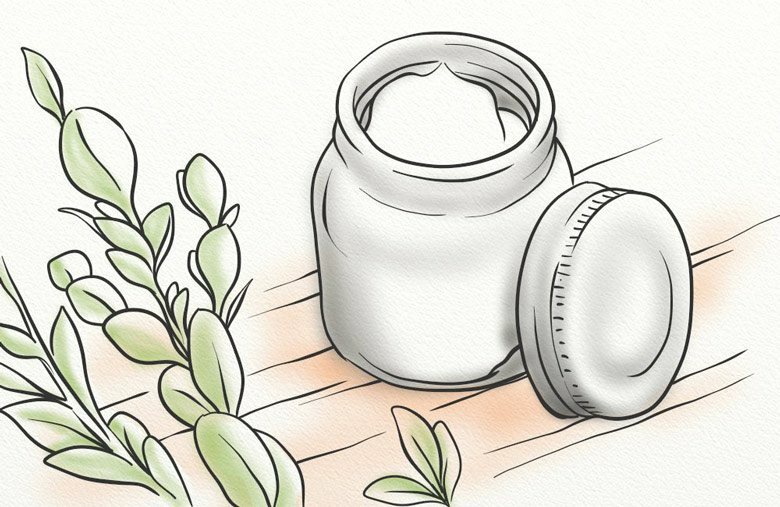 Whether from inflammation caused by the buildup of DHT and other harmful chemicals or an unchecked bacterial or fungal infection, if you believe that inflammation has played a role in your hair loss, then you’ll be glad to learn about coconut oil’s anti-inflammatory properties. One study, published in 2009, studied the anti-inflammatory effects of lauric acid, a major component of coconut oil (6). In this particular study, a bacteria known as P. acnes, commonly linked to acne and acne-induced inflammation, was injected into a small area on the left ears of mice (7). The image on the left (figure d) shows a reduction in inflammation following the injection of lauric acid, while the image on the right (figure e) shows no change in inflammation levels following the injection of the non-lauric acid vehicle. What makes lauric acid an effective anti-inflammatory? Huang et al believe there are two possible contributors to lauric acid’s anti-inflammatory properties (8). The first contributing factor may be lauric acid’s ability to inhibit NF-κB activation. NF-κB is a responsive protein complex, which means its job is to respond to cellular stimuli, such as stress, free radicals, and antigens (9). Sometimes, however, the response of this protein complex can be overenthusiastic, and this can lead to chronic inflammation. The second possible contributing factor is the inhibition of MAP kinase phosphorylation (10). Protein kinases are enzymes which chemically modify the actions of proteins. This particular kinase directs cellular response to stimuli and plays a major role in inflammation. There’s no doubt that lauric acid, the fatty acid which makes up almost 50 percent of coconut oil’s chemical components, can contribute majorly to the reduction of scalp inflammation. For hair loss sufferers dealing with inflammation-induced alopecia, this study shows that coconut oil may be an effective treatment for inflammation. With reduced levels of inflammation on the scalp, your follicles can begin to repair and unclog naturally which improves hair growth. This will allow them the chance to produce healthy, long hair strands. If you want to reap the benefits of coconut oil, then consider these steps as a way to increase its efficacy. As I mentioned previously, the inflammation triggered by DHT sensitivity is detrimental to the health of the follicle. While there are drugs and natural ingredients that can soothe inflammation, there is one other technique that is often overlooked: scalp stimulation. 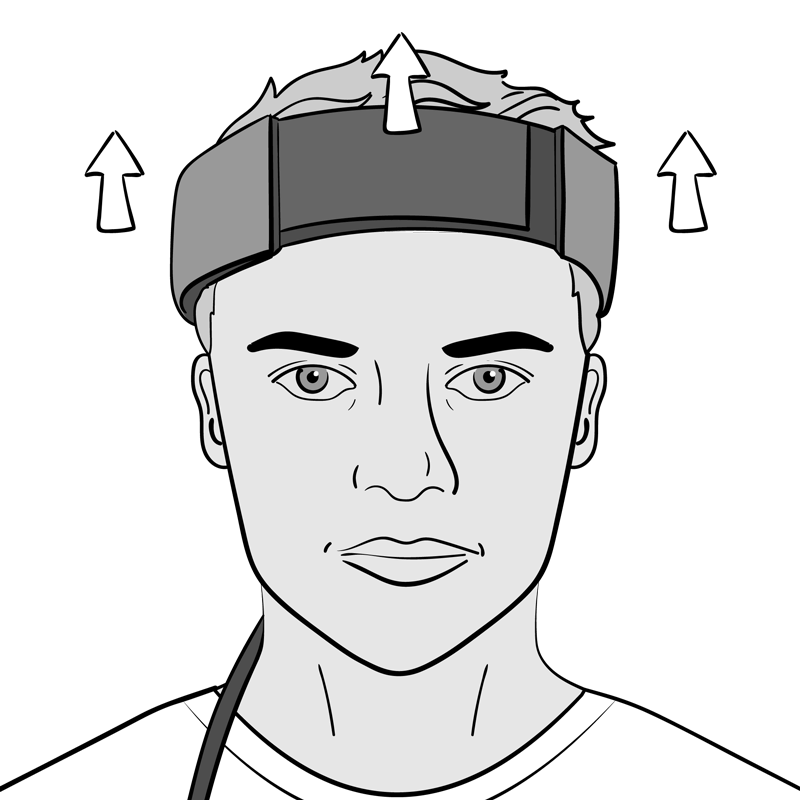 Stimulation of the scalp can be manual (done by hand), or performed with the use of a specialized tool (such as a scalp massager or a dermaroller). These work to increase blood flow to the area, and they can even result in lessening of inflammation. 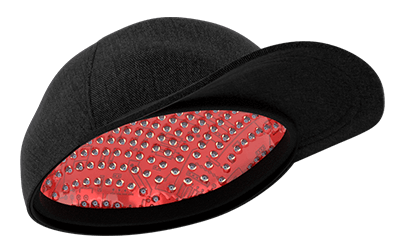 One such method of scalp stimulation is microneedling. This involves the use of tiny needles to puncture the scalp. As these “wounds” heal, they will trigger a healing process that leads to the production of collagen and even reduces inflammation (11, 12). Best of all, you can easily combine scalp stimulation with coconut oil to increase the benefits of both. 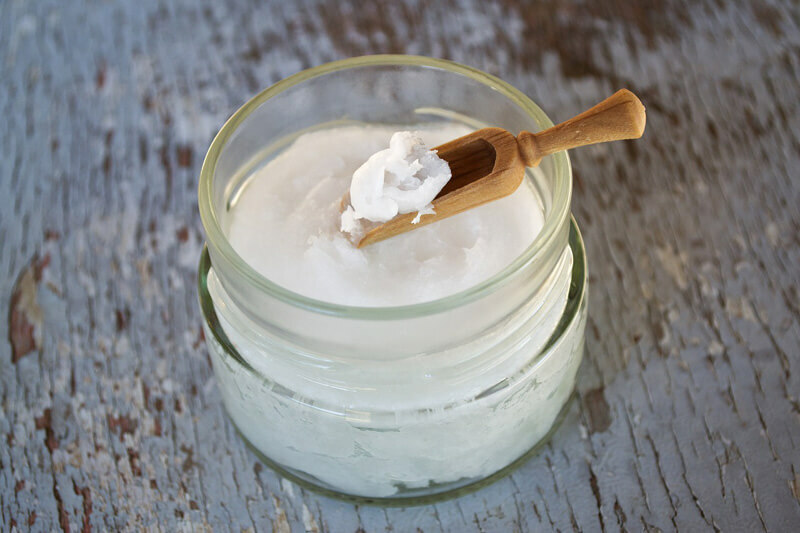 There’s no doubt that coconut oil has an array of beneficial properties. But it’s very unlikely that coconut oil alone is enough to regrow your hair. This is why you might want to consider using coconut oil alongside other clinically-proven treatment methods. More specifically, minoxidil and finasteride. 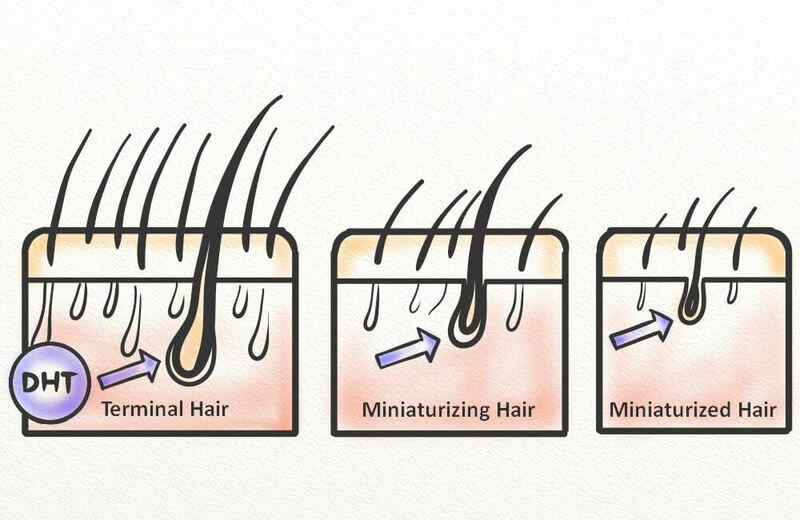 Minoxidil is an FDA-approved topical solution for men and women with pattern hair loss. This drug is believed to work by increasing blood flow to the scalp, and up-regulating growth factors (13, 14). Finasteride is an oral medication that is FDA approved for men only. 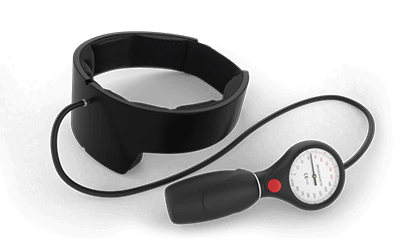 It works by reducing the amount of DHT produced within the body (15). These treatments, used separately or together, have been shown to be effective in combating hairline recession and balding. And more importantly, there’s no reason that these drugs can’t be used with coconut oil (though, in the case of minoxidil, not at the same time). By using a drug like minoxidil or finasteride, you can slow down or even stop the current rate of hair loss. And coconut oil can contribute to a healthier scalp environment, and even play a role in reversing inflammation and miniaturization. Coconut oil is a nutrient-packed source of fatty acids with many health and cosmetic benefits. But is it the right oil for hair growth? Hair loss comes from a fundamental imbalance in the body, and although coconut might help protect the hair (and slow down hair fall) it won’t stop it altogether. This is why you must take a more proactive approach to hair loss, and treat the underlying cause. Do you have questions? Leave a comment below. I can’t wait to try the homemade coconut oil shampoo. Hoping it will help with my dry and brittle hair. Thanks for the info. In the list of your Coconut Hot Oil Treatment ingredients, you say to use 1 cup of Coconut Oil. In the “Method” part, you used the words “Olive Oil”. You might want to correct that. Thanks for catching that, Debbie! Great information, I thoroughly enjoyed reading it. Love the recipes as well. Quite honestly, I just love coconut oil point blank. It’s a great useful oil for so many reasons.